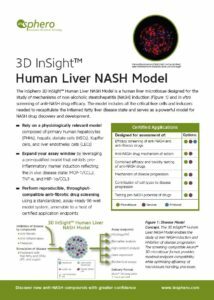 The 3D InSight™ Human Liver NASH Model ideal for the study of mechanisms of non-alcoholic steatohepatitis (NASH) induction and in vitro screening of NASH drug efficacy. Because this advanced model includes all the critical liver cells and inducers needed to recapitulate the inflamed fatty liver disease state, it is a powerful model for NASH drug discovery and development. Our liver platform services team will work with you to design and implement a custom study package tailored to your research needs. When you first partner with InSphero on a NASH discovery project, we recommend you start with a service evaluation project to rigorously test the model using up to four anti-NASH compounds.